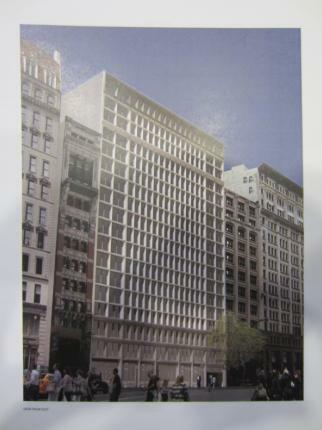 Rendering of proposed building on 7 West 21st Street, New York, NY. Image Credit: MA.com. Commissioners generally praised the concept and design, but asked for further refinements to be presented at a future meeting. On September 24, 2013, the Landmarks Preservation Commission held a hearing on the proposed project for a vacant lot at 7 West 21st Street in the Ladies’ Mile Historic District. The through-block site was cleared in the 1920s, and the applicants intend to build a 185-foot tall development with ground-floor retail and residential use of the upper stories. At the public hearing, Kramer Levin attorney Valerie Campbell said that a special permit would be sought for the project to waive the 150 ft. setback requirement. Campbell noted that the plan did not possess any more floor area than was permitted as-of-right. Higgins & Quasebarth’s Ward Dennis stated that 20 percent of the housing in the project would be affordable, with the rest offered at market rates. The applicants decided not to use setbacks because they would have been visible from street vantages, and detract from district’s character as defined by the loft buildings. Currently, the loft buildings’ facades grow straight up from the sidewalk. The New York Landmarks Conservancy’s Andrea Goldwyn praised the proposal as a “harmonious addition” to Ladies’ Mile, and complemented the “restrained palette” of whites and grays. Landmarks Chair Robert B. Tierney stated that Manhattan Community Board 5 had issued a resolution recommending approval. Adjmi responded to opposing testimony by stating that they had sought to relate to the district through means other than ornamentation, which he believed would not be appropriate on a contemporary building. Chair Tierney thanked the applicants for their “marvelous presentation,” and asked them to further examine the details of the proposal, especially on the 22nd Street facade, before bringing a revised plan to Landmarks at a future public meeting. At Landmarks’ meeting on October 15, 2013, Adjmi presented a revised plan to the Commission. The design was amended to include two-story bay windows at the base of the building facing 22nd Street. Also on 22nd Street, the columns delineating the tripartite facade were moved in one bay, making for a narrower central section. The amount of metal in the primarily limestone base was also increased. Commissioners praised the plan, with Chair Tierney calling the revisions “completely responsive.” Commissioner Fred Bland found the revisions intelligent and appropriate and the plan “a model of contextualism” for a contemporary building in a historic district. Commissioner Michael Devonshire stated that he had full confidence that the project was “in the hands of a master,” however, also expressed reservations, particularly about the lack of detail, which he believed might make the project look like “a denatured historical building” Nonetheless, he joined his colleagues in a unanimous vote to award the revised a project a certificate of appropriateness. LPC: 7 West 21st Street, Manhattan (14-7856) (Sept. 24, 2013) (Architect: Morris Adjmi Architects).